How can we set a certain line thickness for the reinforcing bars? Advance Concrete allows different representations for the bars. The default display of the bars is "Filled exact contour". If this option is activated, the exact diameter of the bar is represented. If you plot the drawing with these settings, the bars will be created as in Figure 2. To change the representation of the bars in the drawings, we activate the "Wireframe" option on the "Advance Project Preferences- Project preferences" toolbar. Using this default, the axis of the bar is represented and the line thickness is "By default" (Figure 4). 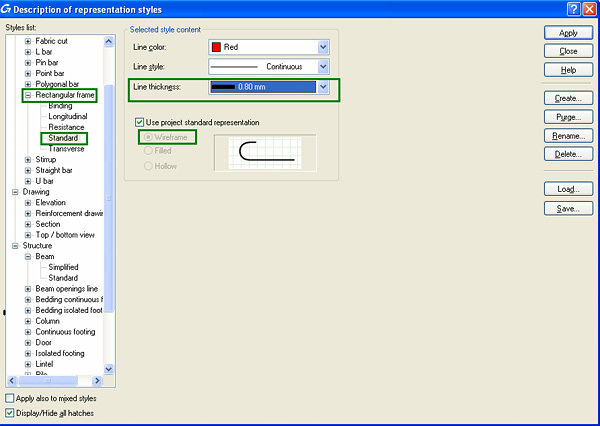 To change the line thickness, click the "Representation style" on the "Advance Project Preferences" toolbar. Next, set the desired line thickness for the reinforcing bar as in Figure 6. 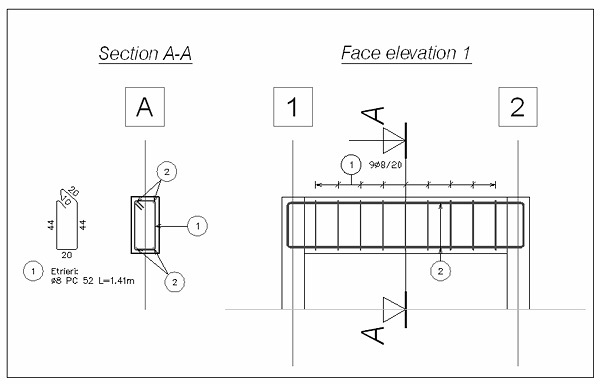 If you follow these steps, the reinforcing bars will be represented with the chosen line thickness (Figure 7). Figure 7: Display mode of stirrups with a line thickness of 0.80 mm.